Margot Jacquard Gold Spot Midi dress. 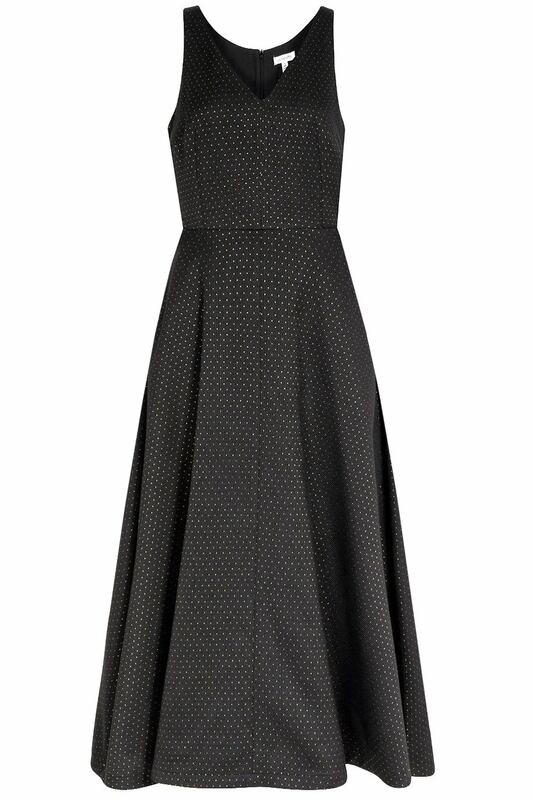 Make a statement in this ultra chic and elegant midi dress with the subtle shimmer of the gold jacquard mini spots. Fitted at the bodice with strategically placed seams, flattering open V-neckline and a long A-line skirt with side pockets creates a slim and feminine silhouette that gives breezy movement with each step. Has concealed back zip fastening, is fully lined and is approx. 125cm in length. Winter collection. Composition: 53% Poly, 28% Cotton, 2% Metallic, 17% Acr.